LAUREL — Laurel fourth graders once again worked with the Kindergarten class during the school year. 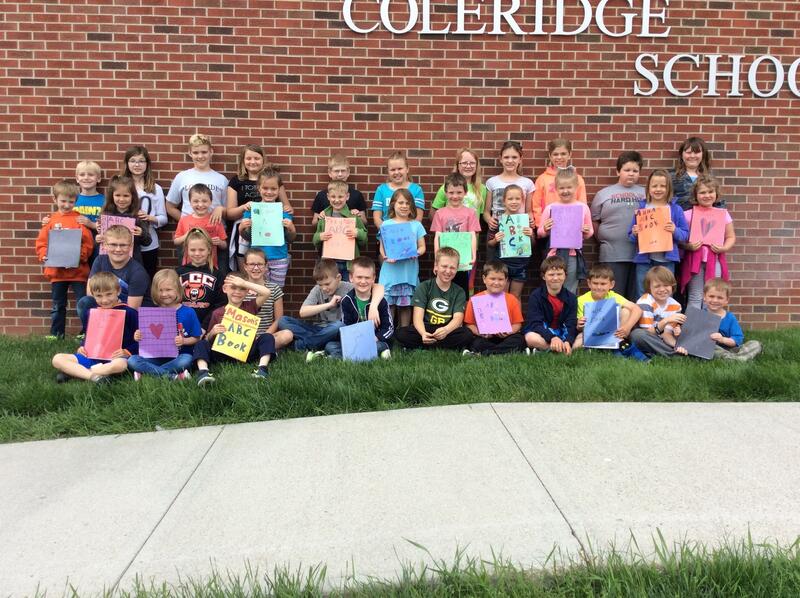 At the completeion of the year, the fourth grade students interviewed the kindergartners and wrote biographies of them. My kindergarten pal’s name is Jacey Janette Folkers. She is 6 years old. Her birthday is March 29, 2012. Her dad’s name is Jason and her mom’s name is Trista. Her oldest sister’s name is Laney Jo Folkers and her twin sister’s name is Hazley Marie Folkers. Jacey and her family have a dog named Cota. Jacey’s summer plans are to go to Great Wolf Lodge as a birthday present from her mom. She is also going to the Mall of America. When Jacey grows up she would like to be a dancer. She said it requires hard work and effort. Jacey likes the letter J because her name starts with J. Her favorite season is summer because she can play outside and play with her dog. She likes writing things in science. She looks forward to going to Fourth grade pals because she gets to color at the end. She likes to draw circles. She enjoys eating chocolate and watching Bizzbark. She also enjoys reading the Velveteen Rabbit and Wonder. Our kindergarten pal is Nash Ryan Cunningham. His dad’s name is Ryan and his mom’s name is Jenny. Nash’s birthday is April 30th 2012. He is 5 ½ years old. Nash has an older sister named Piper. He has a dog named Oden and a cat named Midnight. He likes to play baseball. When he grows up he wants to be a Major League Football player. He wants to play tackle. His favorite color is black, his favorite letter is h, his favorite number is 100, his favorite shape is a square, his favorite food is mashed potatoes, his favorite subject is science, his favorite season is spring, his favorite TV show is football, his favorite movie is Walking Dead, and his favorite book is Snakes. My kindergarten pal’s full name is Kynslee Skye Hoffart. She lives in Belden, Nebraska. She is 5 years old and her birthday is on June 24, 2012. Her dad’s name is Derek Hoffart and her mom’s name is Kayla Hoffart. She has one brother and her brother’s name is Bryson Hoffart. She has a kitty and also 3 kittens. She likes to watch movies during her free time. This summer she is going to play at the pool, play in the sprinklers, and she is going to play outside. When she grows up she wants to be a teacher. I asked her what does Mrs. Wolfgram do and she said, “ In order to be a good teacher like her, you have to pick the leader, get good grades, put forth effort, and put up a fake coin each day.” She said that she needs to be good at school to become a teacher. Her favorite color is pink. She loves Mac & Cheese and it is her favorite food. Her favorite number is one-hundred because she wants to live to be one-hundred. She knows all of her shapes, but her favorite shape is the circle. She likes the letter K, and her favorite subject is P.E. Her favorite season is Spring. She likes the movie Trolls and her favorite TV show is LOL. My kindergarten pal’s name is Jeremiah John Kinkaid. He lives in Laurel. Jeremiah is 6 and he was born on March 8. His dad’s name is Shane and his mom’s name is Denise. He has 2 sisters named Jadyn and Jolynn. He also has a brother named Justin. After school, he likes to play hide-and-go seek. He likes a lot of stuff, too. His favorite colors are red and blue and his favorite letter is R. He likes the number 8 and likes rectangle. His food is spaghetti. Math is his favorite subject and his favorite season is summer. Scooby Doo is his favorite TV show and his favorite movies are DC superhero movies. His favorite books are I Spy books and Play-Doh is his favorite activity. He plans to go to the waterpark and New York. He wants to be a professional basketball player. He will become a basketball player by practicing, working hard, and being a fair sport. My kindergarten pal is Jade Rose Fettig. She lives on 5th street. She is 6 years old and the youngest in her family. Jade was born on September 9th. Her dad’s name is Ryan and her mom’s name is Teri. She doesn’t have a sister but has 3 older brothers. Their names are Bryce, Damon,and Alex. She has a cat named Bella. Jade likes to play with her cat after school and on the weekends. Her favorite colors are purple and red. She likes the letter J because her name starts with a J. She loves the letter 4 because she has 4 letters in her name. Jade loves hearts because she says they are lovely and stand for love. Her favorite food is jello. She loves math. Jade loves spring because there are flowers and lots of animals. Her favorite TV show is Alvin and the Chipmunks. She loves the movie Moana. She also loves the book Press Here. She said the favorite activity she did with me was the Easter Egg Hunt. In the summer Jade likes to go up to her grandma’s house. Jade wants to be a nurse at the nursing home when she grows up. She said that if you work there you would have to clean, wash clothes, and serve and make food. Jade said to become a nurse she has to train and go to college. My kindergarten pals full name is Lizzbeth Clair Lempke. She lives inside Laurel. Lizzbeth is 6 years old. Her dad’s name is Johnny and her mom’s name is Sherry. Her sister’s name is Samantha and her brother’s name is Zaler. She has three cats name Ms. Hissy, Ginger, and Shorty. After school, she likes to play outside. Her summer plans are to play outside and go to swimming lessons. Lizzbeth wants to be a doctor when she grows up. She wants to do good in school so she can go to college and she wants to work hard, be nice, and get to be a doctor. Lizzbeth likes the color red. Her favorite letter is j. Her favorite number is 8 and her favorite shape is a circle. Her favorite food is spaghetti. She likes the subject p.e. Her favorite TV show is The Ugly Duckling and her favorite movie Boss Baby. She likes scary books. She likes the season summer. This is about Myles Quinn Parsons. He lives in Laurel, NE and was born March 17th. His mom and dad’s name are Bob and Paige. His siblings are Liam and Tiernan. He can’t have pets because he is allergic to them. His favorite color is red. Myles’ favorite movie, tv show, and book are Finding Nemo, Paw Patrol, and Who Would Win: Whale vs. Giant Squid. His favorite food, letter, number, and shape are bananas and apples, M, 100, circle. His favorite subject is Guidance. His favorite season is summer. His summer plans are to go swimming. He wants to be a principle when he grows up. If someone gets in trouble they go to detention. His favorite thing to do with me is the activity. My kindergarten pal’s full name is Emma Jaelee Kvols. She lives in Laurel, NE. Emma is 6 years old and her birthday is November 15th. Her parent’s names are Tyler Kvols and Cassandra Kvols. She has a brother named Ethan Kvols. Emma has a golden retriever Mini. After school she likes to watch TV and play with Mini. Emma’s favorite color is pink. She likes the letter E because it starts in the beginning of her name. She loves the number 100. She likes the shapes the diamond and the star. Emma LOVES spaghetti. Her favorite “subject” is fourth grade pals. She loves summer because she gets to go to the pool, swing, and play with Mini. Emma loves the TV show Horten. Her favorite movie is Black Panther, and her favorite book is The Day the Crayons Quit. Emma’s favorite thing to do with fourth grade pals is the Easter egg hunts and the activity sheets. Emma’s summer plans are to go to the pool and swing. When Emma grows up she wants to be an artist. To be that she said she has to color in the lines and color everyday. My pals full name is Josh James Torno. He lives in Coleridge. His birthday is March 12, 2012 and he is 6. His dad’s name is Robert and his mom’s name is Lindsey. He has two sisters, Sabrina and Madeline. He has four dogs and one cat. He likes to play tag, baseball, and soccer. His favorite subject is math. His favorite movie is Transformers and his most liked TV show is Teen Titans Go. His favorite book is Zoomer and out of all the seasons he likes summer the best. He likes the color blue and his favorite letter is Z. My kindergarten pal’s full name is Peyton Marie Benson. Peyton lives in Laurel, Nebraska. Her birthday is September 12th. Her mom’s name is Elizabeth and her dad’s name is Shannon. Peyton has no pets or sisters. Peyton has two brothers. Their names are Hunter Benson and Shane Benson. Peyton likes to play at the park and at home on the weekends. When Peyton grows up she wants to be a farmer. She wants to be a farmer so she can get food and milk. Peyton likes the color blue, her favorite number is nine, her favorite subject is P.E. and her favorite shape is a diamond. Peyton’s summer plans are going to the pool in Laurel and going to the snowy mountains. My Kindergarten pal’s name is Carter Lee Rogers. He lives in Laurel he was born on april 30th. His parent’s names are Daryl and Iva. He has 3 siblings: Ray, Tay, and Romio. He has two pets Coco and Rockie. After school he goes to the park. His favorite things are the color blue. His favorite letters are a and c. He likes the number four. He likes the rectangle. His favorite food is spaghetti. His favorite subject is math. He likes the season summer. His favorite TV show is Spongebob Squarepants. His favorite movie is the Spongebob Squarepants movie Sponge Out of Water. My kindergarten pal’s name is Nate Langford. He lives in Laurel, Nebraska. He is six year old. Nate’s Dad’s name is Jericho. His Mom’s name is Kristen. His brother’s names are Shane, Eric, and Jericho. He has a pet named Buttercup. He likes to play Lego Worlds. His favorite letter is A, number is 6, and favorite shape is a square. He likes ramen noodles. His favorite subject is kindergarten pals and favorite season is spring. Nate’s favorite show is Spongebob Squarepants. His favorite movie is Jurassic Park. He likes dinosaurs. He is planning on swimming and going to Florida this summer. He wants to be a teacher when he grows up. He said to teach kids he has to be tall. To be a teacher you also have to be kind he said. We are writing about John Abraham Fraga. He is in kindergarten. His age is 6. He lives in Coleridge. In the summer he’s going to play with his legos. When he grows up he wants to be a rockstar. To do this he said, “sing, play the drums, and play the guitar”. His favorite letter is z. Transformers is his favorite movie. He thinks hotdogs are his favorite food. Red is his favorite color. My kindergarten pal is Madison Irene Olson. She lives in Concord,NE. Madison is 6 years old also her birthday is on September 23rd. Her parent’s names are Mark Olson and Tiffany Olson. She has 3 older siblings and they are Justice, Dillon, and Tyler. She has a dog named Morgan. After school she plays with her dog and toys. Her favorite color is purple. She likes the letter M because her name starts with M. Her favorite number is 23. She loves circles. Madison’s favorite food is macaroni and cheese. She likes math. Summer is her favorite season. Her favorite movie is FROZEN. She loves when they read her Biscuit. When she grows up she wants to be an artist. They work hard to get to the goals. She wants to become an artist by coloring good and training.